The Developmental Educational Assistance Program (DEAP) is a not for profit organization that provides a variety of family education, support, childcare, health nutrition and residential services to families, children and adults. Services are provided in 17 eastern Montana counties. Satellite offices are located in Colstrip and Glendive. 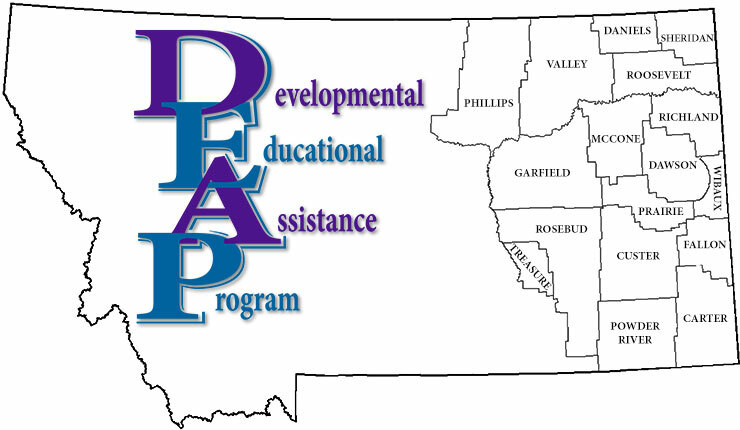 DEAP successfully administers services through contracts awarded by the State of Montana’s Department of Public Health and Human Services (DPHHS) including Developmental Disability Services, Child and Family Services, Health Policy and Services, Human and Community Services. DEAP continues to respond to opportunities to expand services, and to seek other private and public funding sources that can support people’s essential needs in ways they choose. DEAP was organized in 1976 to provide family education and support services to families whose children had developmental disabilities or were at risk of developmental delays. Since organization, DEAP has expanded services and programs to include evaluation and diagnosis, caregiver, early intervention, supported and community living, family preservation, childcare resource and referral, and health education / nutrition (WIC) services.